It’s time to get messy and have some fun! 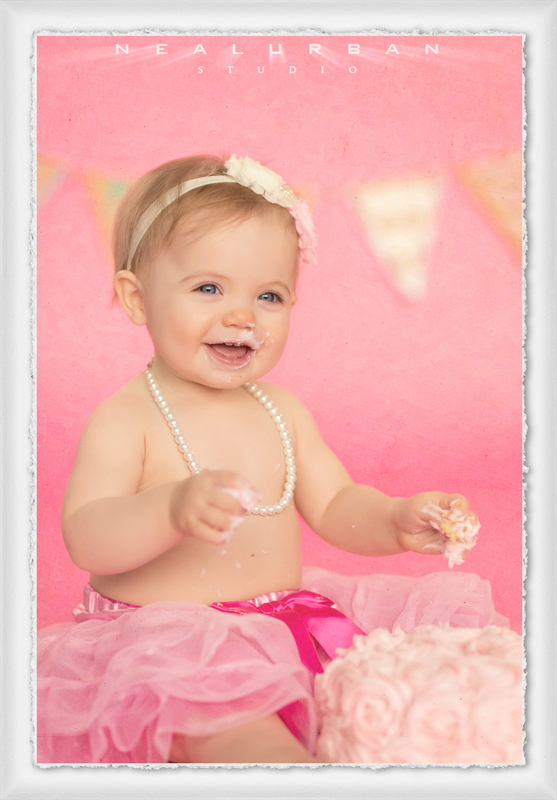 First Birthday cake smash photo shoots are just the ticket! There are definitely no forks or napkins for this cake. The messier the better! This image was taken by one of our photographers, Shane. It is also his beautiful daughter. She was celebrating her first birthday, so it was only natural to bring her into the studio. She even got all dressed up in her tutu and pearls for the occasion. We sat her down and put the cake in front of her. (The beautiful cake was made by Andrea Amodeo from Blackbird Sweets in Buffalo). At first she just stared at it. She wasn’t sure what to do. Shane gave her a little taste of frosting and that was it. She dove right in. It got to the point where she had so much frosting on her hands, she couldn’t move her little fingers. She was having so much fun, while daddy was clicking away with the camera. Every image was a keeper. Neal and I were helping behind the scenes. We got to jump around and be silly to make the baby laugh. What a great collaborative effort by all and a beautiful image by Shane!